My husband and I keep talking about how it doesn’t really feel like Christmas. Maybe it is the weather which feels more spring than winter. Maybe it is that we both are working right up to the very last minute, so haven’t had the chance to relax into the holiday like we have in the past. Who knows? But ready or not, feels like it or not, this week is Christmas. And this bread tastes like Christmas. 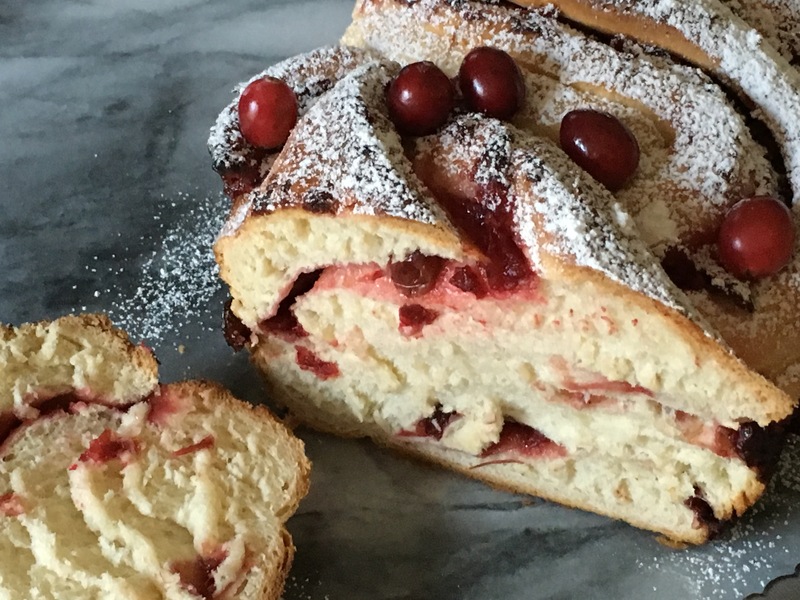 There is a rich, soft yeast bread, there is tart and sweet cranberry filling, and there is a super sweet powdered sugar top: apparently in my mind those things equal Christmas. Plus, it is an unspeakably beautiful bread. This is truly a bread to impress your fiends and family. I hope you are spending this holiday with your friends and family. And I hope that there is laughter, good food, and warmth. I have had this recipe bookmarked on my “To Make” wish list for years. Slowly it moved to the top of the list and taunted me every time I went to go find something to make for dinner. I wanted to make it so bad! But I needed the right situation. It makes one large bundt pan or two loaf cakes and that is a lot of cake for my husband and I to consume. But I have a holiday party at work this week and I am pretty sure my husband and I can handle eating one loaf cake. Especially when it is this good. This is a dark, rich, chewy on top, spicy, moist cake. It is surprisingly easy to make but uses a lot of pricey ingredients which pushes it firmly into holiday and special baking for me. While it is an easy to bake cake I will warn you, especially if you are making the bundt pan version, this cake sticks. I both greased and floured my loaf pans and both cakes lost a good sized chunk out of the bottom. I considered that the reward for baking the cake and consumed most of it (it was the bottom, no one will ever know) but this will be a lot more problematic in a bundt pan. My only advice is go old school and lavishly butter the thing within an inch of its life then coat with flour and… well… pray. Or just plan on eating the whole thing yourself and who cares how it looks… that works too. Thanksgiving is over and even the leftovers are gone. The Holiday window displays are up in New York and we actually had some frost on the ground this morning. I am beginning to believe it is really December. Tonight is the first night of Chanukah so naturally we made Latkes for breakfast and are planning to buy our Christmas tree tonight… on our way home from a work Chanukah party. Interfaith marriages are fun: Do all the holiday things! All the food! All the parties!! I put this recipe up a few years ago but I am reviving it. It is just too good to let it fall into archive obscurity. And, once you get past grating the onion, it is really not that hard.